In 1994 the 200th anniversary of Orthodoxy in America was celebrated — the bicentennial of the establishment of a Russian Orthodox mission on Kodiak Island, Alaska. On September 24, 1794, ten missionaries from the Valaam Monastery (see our article on Valaam) in the St. Petersburg (Russia) diocese, who had traveled for a year across 7,000 miles, finally reached their harsh new mission land in Alaska, or "Russian America," which had been a part of the Russian Empire until its sale to the United States in 1867. Only one of these original missionaries survived and remained in America—Holy Father St. Herman. American Orthodoxy today owes a great debt to these ten missionary monks, most especially to the simple and humble ascetic monk, Father Herman. Truly the "North-Star of Christ’s Holy Church," and the last survivor of the original 1794 mission, he worked among the Alutiiq people for 43 years, teaching them by word and by the example of his holy life and great deeds. For most of those years he lived on Spruce Island—his "New Valaam"—teaching and caring for the natives as his beloved children, frequently defending them against the exploitation of the Russian fur traders. The people quickly grew to love him and came to him with all their problems. He lived the most ascetic life possible, eating and sleeping little, wearing the same ragged clothes year-round, feeding the birds and wild animals (even bears), and in continual prayer with his constant companions — God, the saints and the angels. When smallpox, brought by the European ships, ravaged the native Alaskans, Father Herman personally ministered to them, and brought all the orphans to his New Valaam, where he took care of them. He built an orphanage, school and chapel. He grew food in his garden, caught fish and baked cookies for the children. He taught them in his school, and showed them by his example how to live a godly life. Indeed, the children and adults loved their dear Apa (grandfather), and the Alaskan native people, most of whom are Orthodox, have maintained their devotion to their beloved holy man until today. 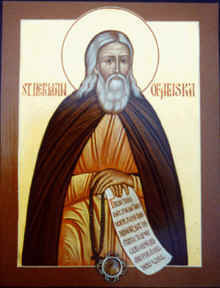 St. Herman was a clairvoyant wonder-worker, who saw into people’s hearts and into the future. Once, when a tidal wave (tsunami) threatened the island, the saint put an icon near the sea, and said that the water would not come past the icon. It didn’t. Another time there was a similar experience with a forest fire. He told the people that after his death outsiders would forget about him for 30 years. Indeed, 30 years later, in 1867, at the time of the sale of Russian America to the United States, Bishop Peter of Alaska began the formal investigation of St. Herman’s life, which led to the publication of his Life in 1894 and eventually, to his glorification in 1970. Blessed Father Herman has worked countless miracles since his repose in 1837, as he continues to guide those who follow the Orthodox way in America. St. Herman's relics were brought from Spruce Island to the Resurrection Church on Kodiak (photo to the left) at the time of his glorification on August 9, 1970. This Resurrection Church is the successor of the 1794 Resurrection Church founded by St. Herman and his fellow missionaries upon their arrival on Kodiak. A beautifully carved wooden reliquary in the Resurrection Church contains the coffin with Father Herman's relics (photo to the right). On top of the reliquary are: a large icon of the saint (center); as well as the "paramon" cross and metal chains (on the left) that he wore (shown in the icon at the top); and his klobuk (monk's hat), in the glass box on the right. Also to be found at this church is Father Herman's hand cross, which he is shown holding in the icon at the top. Photos are by the author. The icon at the top was painted/written in 1970 by His Grace, Archishop Job of Chicago (at the time, Fr. John Osacky), of blessed memory, and presented to Holy Resurrection Church by him at the time of the glorification of St. Herman on August 9,1970. The second icon above was painted/written by Fr. Theodore Jurewicz of Erie, PA, and is at St. Innocent Orthodox Church in Redford, MI; it contains a small particle of the holy relics of St. Herman.